at 11:00 on Tuesday 13th October, 2015 in DCU St Patrick’s College Drumcondra campus, room E214. St. Patrick’s College has participated actively in Maths Week every year since its inception in 2006, and the Maths Department is honoured to have such a distinguished speaker this year as Desmond MacHale. 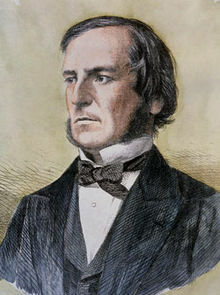 George Boole was born in Lincoln on 2nd November 1815. He was the first professor of mathematics at Queen’s College Cork, from 1849 until his death in that city in 1864. His seminal work, An Investigation of the Laws of Thought (1854), laid the theoretical foundations for all the digital machines and gadgets that are ubiquitous today. A new edition of Des MacHale’s biography of Boole, “The Life and work of George Boole: A prelude to the digital age“, has just been published. There is no one better qualified than Des MacHale to speak on him, in this the bicentenary year of Boole’s birth. Des MacHale is well known, not only as a mathematician, but as one who takes a serious interest in humour. Do consider coming along to enjoy a lecture that promises to be as scintillating as it is informative!